Ants generally live in large colonies and have a network of tunnels. The majority of the colony is underground and will simply relocate or resurface a few weeks later if sprayed with supermarket strength sprays and liquids. With SR Pest Control's knowledge, products and equipment we will get control and rid your home of these nuisance pests. Externally thoroughly inspect and establish nests and problem areas. Treat the ant nests and effected areas with an appropriate liquid insecticide to flood the tunnels and galleries. The insecticide we use has a particularly long residual life in soil and is ideal for both barrier and nest treatment. Internally we apply a safe, residual barrier spray to the skirting boards throughout the house for a long term barrier. We use specific attractant baits that are taken back to the colony where it can target many more members of that colony including the queen. These come in the form of 'ant cafes', gels, dust and granules. We advise a tidy up in and outside your property. Remove or relocate items leaning against external walls this will allow for a good clean continuous barrier around the external walls. Pack items (clothing, toys, dishes) away within the house for easy access. Vacuum and mop prior for maximum results. The products we use will be taken back to the colony where it is passed on to the larvae. This accelerates the destruction of the colony which should only take 2 – 3 weeks. We recommend not to wipe products off walls or mop for a week after treatment. SR Pest Control will also advise on non chemical controls specific to the particular job. Yellow to brown ant. Abdomen is dark, sometimes striped. They have invaded Far North Queensland and landowners now have to take responsibility for the management of infestations on their own properties. 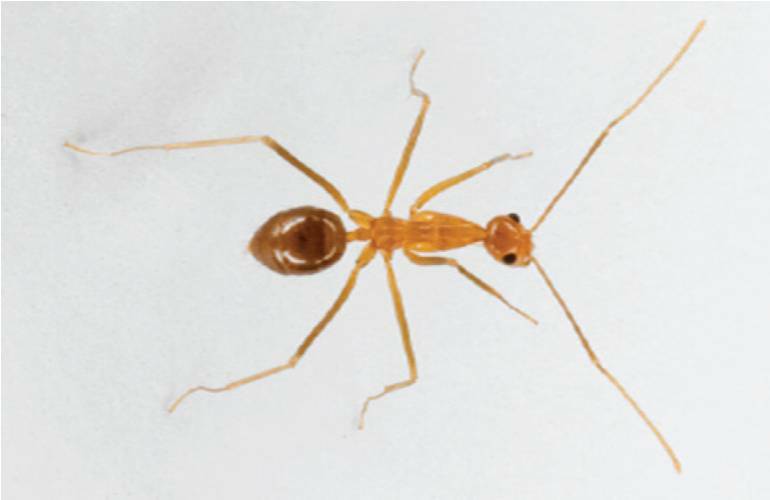 These ants have been classified as unable to be eradicated and have to be managed. They are an introduced species and are destructive to the native fauna and flora. They spray formic acid, which causes burning and irritation of skin and eyes in animals and humans.